I always get somewhat melancholy as fall arrives across the landscape; the bounty of fresh fruits, veggies and herbs are coming to the end of their cycle and I know they will be missed. I wonder how I’ll make it even as the season progresses and we meander through pumpkins and squash and pomegranate. Then every year, I come alive again with the renewal of citrus. 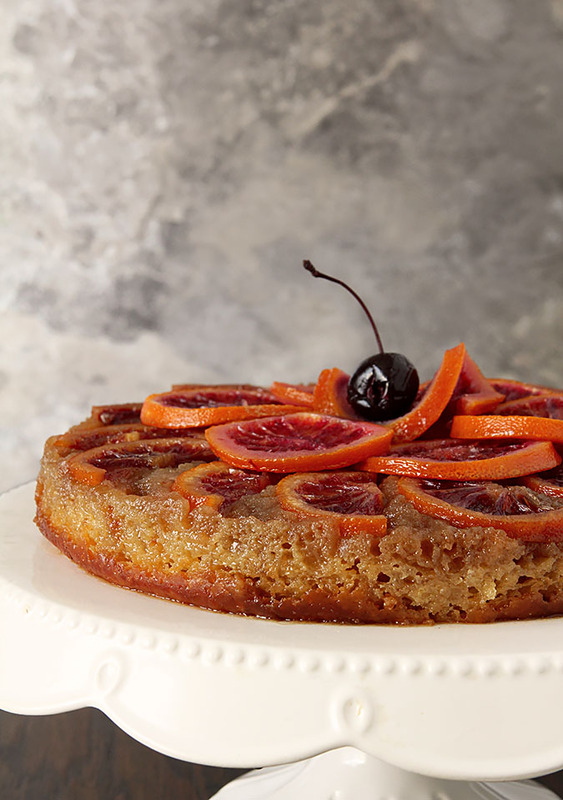 Especially the gorgeous blood oranges I used for this Blood Orange Upside Down Cake. Blood Oranges are a relatively ‘new to me’ form of citrus but all it took was just one look. They are so incredibly beautiful with their ruby red flesh more reminiscent of a grapefruit, and their beautiful speckled rind with a rainbow of colors from yellow to orange to the appropriately named blood red. It’s Progressive Eats time again and this month our lovely host decided that a menu consisting of all things citrus might brighten our spirits and yours too. I originally had something else in mind but I’m glad I punted and made it all about this cake. I’ve grown very fond of using citrus that is candied in a sugary syrup and left to caramelize a bit. The rind softens and is edible and the result is both beautiful to see and a real treat for the taste buds. While the pith associated with the rinds of oranges is usually very bitter if using whole fruit pieces in a recipe; baking it into this cake changes everything. It reminds me of onions a bit how the flavor and composition changes so dramatically once they are cooked. The rind on the oranges on the top of the cake and the ones I candied for garnish have softened from the heat allowing the peel to add a more intense flavor to the finished dessert. I’m sort of addicted and trying to make sure everyone around me is too! While one of my most favorite desserts of all time is Pineapple Upside Down Cake, this one is a new favorite that will be made again. The caramelized topping combined with the gorgeous citrus and a dollop of whipped cream flavored with more orange zest made for a welcome treat after another long winter day. I guarantee you it will make it’s presence known again with coffee for breakfast; it’s perfect for either and lucky me…I get it for both! Take a peek at the wonderful assortment of dishes we’ve put together for you with a variety of fresh citrus from this season. I know you’ll find something you’ll love; I know I want it ALL!! Pour the butter into a 9-inch springform cake pan. Use your finger to run a bit of butter around the side of the pan so it's well-greased. Arrange the orange slices in the pan to cover the bottom. Whisk flour, granulated sugar, baking powder, baking soda, and salt in a large bowl. Add eggs, egg yolk, buttermilk, butter, and blood orange zest and juice; mix until no dry spots remain (a few lumps are okay; do not overmix). Pour batter over oranges in pan and bake until top is golden brown and cake pulls away from sides of pan, 35–40 minutes. Place pan on a wire rack and allow cake to cool for at least 10 minutes before inverting, slicing, and serving. In a medium skillet, combine the water and sugar and bring to a boil. Add the orange slices and cook over moderate heat, turning them occasionally, until the liquid is reduced to a thin syrup and the orange slices are translucent, about 20 minutes. Reduce the heat to moderately low and simmer until the syrup is thick and the slices are tender but still intact, turning occasionally, about 10 minutes. Transfer the orange slices to a rack to cool. Reserve the syrup for another use. Once cooled; top the cake with the additional orange slices. Serve with a dollop of orange zest whipped cream if desired. Make Ahead - The candied orange slices can be refrigerated for up to 2 weeks. Welcome to Progressive Eats, our virtual version of a Progressive Dinner Party. This month we’re sharing dishes featuring citrus fruits! Our event is hosted by Coleen who blogs at The Redhead Baker. Citrus fruits are in season this time of year, and the flavors will brighten up even the dreariest winter day. You’ll certainly find a delicious recipe to add to your repertoire! Gorgeous, gorgeous, gorgeous. I saw this on social media the other day and began to swoon. You make the best stuff. Aw thanks…I do try to keep people interested; just wish you were closer and I could share! Oh my goodness this looks fabulous! 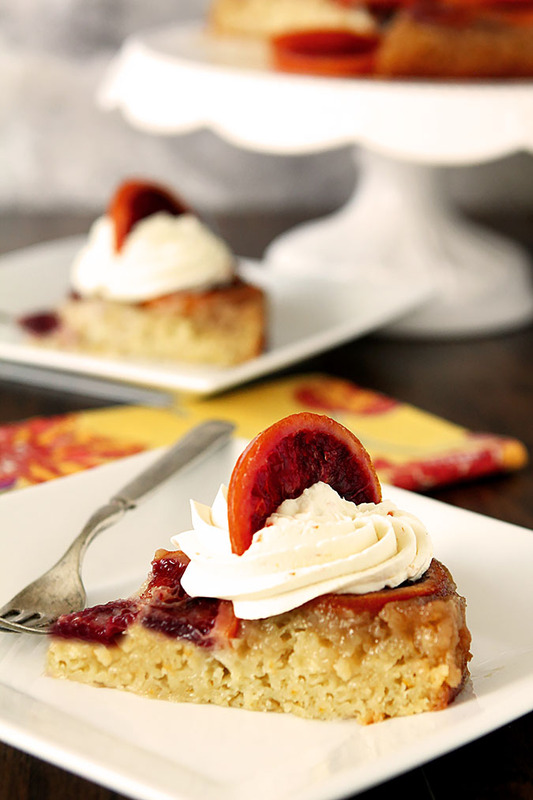 I do love blood oranges and as a kid, I was wild for pineapple upside down cake. What a wonderful winter dessert. It was! And thanks…I’m an amateur so sweet comments about my photography simply make my day! I do love an upside down cake–they’re so comforting and perfect with a cup of coffee. Your blood orange version is just lovely and the candied slices are the perfect accent! What a perfect way to show-off those beautiful blood oranges! This cake looks super moist and full of flavor – I’ll take a large slice, please. I also love the pineapple version; there is one right here, right now! This is a great idea and what a color! This is stunning Barb! I love the look of blood oranges and also Cara Cara – so spectacular. And you are right, citrus season fills in the gap while we wait for summer! This cake looks so wonderfully moist, Barb! It’s gorgeous. I love blood oranges, and am always excited to see them return to the markets! 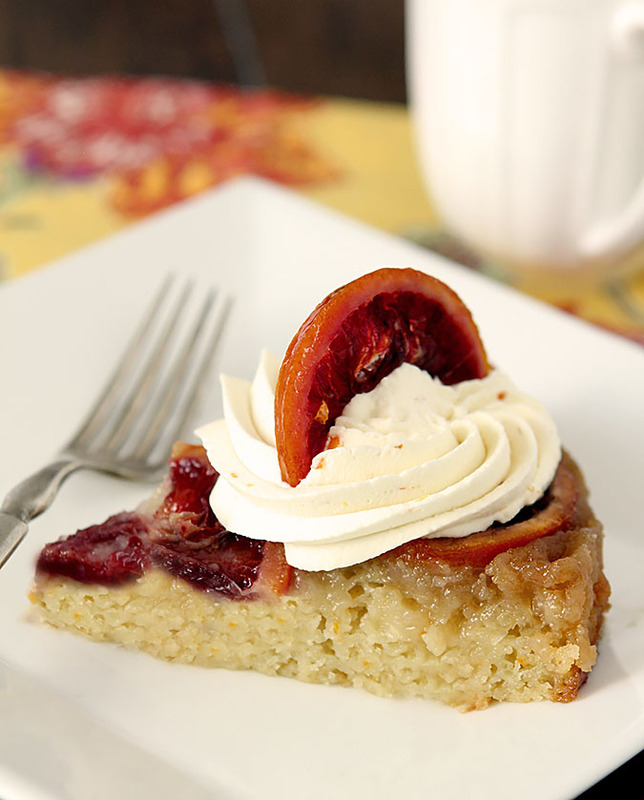 Oh such a wonderfully moist cake with delightful blood oranges! You have done it again! Spectacular! We eat a lot of citrus at this time of the year. Crave the stuff, actually. This is a great way to use it — such a pretty cake. Thanks! What a spectacular twist on the classic upside down cake!!! Blood oranges make quite a statement and I’m certain your cake tastes as amazing as it looks!! !